Three topics to discuss with you today, dear reader. III. How to react (or not) to social media. Read on for the intersection of I, II and III. I. Publicists pride themselves on their use of language. On spelling. On grammar. On precisely capturing a taste, a moment, a glimpse of landscape or of history, etc. And, in fact, publicists often are called on to proofread, line-edit and react to written material. II. When a winery has an outside publicist, that publicist is a healthy filter or bridge between a journalist and the winery. What if the writer has inadvertently been insulted? What if a wine sample was flawed? Those are just a couple of examples of situations where the outside publicist can smooth the waters, repair the relationship, re-orient any mistakes. III. Bingo! The publicist has successfully pitched the winery. The journalist has been, seen, tasted, talked to, been toured through the vineyard and winery. The journalist then shares the experience with an initial social media message. Great! Slam-dunk! Good work all around! Right? In a recent situation I witnessed, no. What went wrong? The impulse to correct the writer’s use of language. The writer wrote: Highly recommend a visit to X. Such a unique place, with wines that reflect it. The winery saw the post and commented: Wines that reflect the beauty of their origins. Because of the writer-publicist relationship, the writer contacted the publicist to share his annoyance. It remains to be seen if the writer will devote one more drop of ink to this winery. A simple 1 + 1 = 2 has turned into a more complicated equation. Can the publicist repair the problem? Not clear. Here’s the lesson: RESIST THAT URGE! As I mentioned at the start here, I’m constantly correcting and catching typos, misspellings and incorrect use of language. My family teases me on how often I find these types of mistakes in places where they shouldn’t be—public signage, movie credits and so on. One of the accomplishments of my life was going to Sacramento in the 8th grade to represent San Diego County in the spelling bee….I placed second in the state, goofing on the word ‘chauffeur.’ So you can tell, I live to find typos and correct them. Long live ‘tracking changes’ on Word. But. But. If you’re a winery…and the journalist has had that very precious one-on-one visit with you, and you’re eagerly haunting the Internet for their coverage….it’s understandable that you’re very eager to read what might appear. But there is an enormous PR lesson here: resist the urge to comment. Think it through. A simple “thank you” is terrific and suffices. If possible, huddle with your publicist. Weigh the pros and cons. A grammatical goof is not worth endangering the winery-journalist relationship. A substantial factual error might be…but if so, then that’s a conversation to have in private, or on the phone, not in one of those oh-so visible social media public forums. For those of you who know my partner in SWIG, Julie Ann Kodmur, you know she’s overly modest. I know, unusual for a PR type. Still, she is a modest one. So modest is she that she was going leave unsaid on this blog that she was JUST AWARDED BEST PUBLIC RELATIONS AGENCY/PROVIDER by Vineyard and Winery Management Magazine. Shhhhh….Don’t tell her about this post. She’d blush. In general it is the job of a PR professional NOT to get noticed. Rather, it is the job of the PR professional to get their clients noticed. So, when notice is taken of us in some formal manner, we are at once surprised and truly gratified because it just doesn’t happen much. You can read the entire list of award winners here. 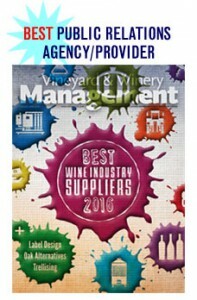 The winners are picked by a vote of Vineyard and Winery Management readers. As you can imagine, although Julie Ann knew she had been nominated, she told no one, lobbied no one for votes, nor even mentioned her nomination to her partner in blogging crime. Shame on her. I would have lobbied for her! That said, her recognition is one for the little guys in our profession, those little one-person consultancies who toil alone and without a large staff, but rather with a network of colleagues and contacts that keep us sane. So again…DON’T TELL JULIE ANN ABOUT THIS POST!!! The recognition might embarrass her. However, do raise a glass to one of the best PR practitioners in the biz. Here’s a stormy weather welcome to the attendees and speakers of the 12th Annual Symposium For Professional Wine Writers taking place this week! A busy several days of tastings, seminars and networking await the 30 writers and the prestigious presenters, who hail from all points of the compass–Canada, England, Asia, Bordeaux, New Zealand, Florida, Nevada, Texas, New York, Washington D.C., Colorado, Chicago, San Francisco, San Diego, Santa Barbara, Sonoma and Alameda. Then, of course, the Symposium dovetails into Premiere Napa Valley, on Saturday, which is generating its own momentum with events taking place all over the Valley this week. Hats off to the diverse number of topics being discussed, wines being tasted, wineries being profiled, vineyards being tromped through and vintners being interviewed. Wouldn’t it benefit all of us who are marketers in the wine business to understand how to improve our communication skills, learn how to ask the most perceptive questions, ferret out the hottest trends, as this lucky group is able to do this week? What a terrific opportunity for this group of attendees this year. However, it is unfortunate that the Symposium attendees won’t be learning about the most important issue in Napa Valley today: that would be the cloud of anti-winery sentiment hanging over the Valley these days. Try to go get a new winery permit today in Napa County: it can take years. Try to plan an expansion or a re-model: it could take years. Want to revisit how many visitors your winery can receive? Good luck: your neighbors are watching…and counting…and will show up at your hearing to protest. You could even say there’s a de facto moratorium on all winery development right now. A small group of noisy activists are trying to go viral with their list of complaints about life in the Napa Valley. What’s a winery to do? If an entrepreneur comes here with the hope of starting a winery, that heretofore-successful skill set won’t apply. What is APAC, a writer from New Zealand might ask? Here in the heart of prestigious wine country, local officials have wondered about “how much marketing is too much marketing?” And a new term is being used to stir up anti-winery feeling: “binge tourism.” That’s used to denigrate a winery including hospitality events as part of its marketing and sales. What an enormously complex topic the Napa Valley wine industry is….here’s hoping we may have intrigued a writer or two to look beyond the Symposium schedule. Might be worth mentioning that these issues are starting to appear in other wine regions as well….. I was one of more than a hundred people who attended the memorial for Jay Corley recently. The family organized a letter-perfect event. Perhaps it’s helpful, here at SWIG, to step back and recognize how important every ‘little’ detail is in something like this. Where’s the PR here? In honoring someone’s life, you’re telling and re-telling their story. You’re defining their image, how you want them to be remembered, making sure the listeners know of the person’s achievements, accomplishments and above all, get a sense of his or her personality and uniqueness. The obituary appeared in the local papers, with details of the memorial. The winery’s website shared the sad news with an elegant photo with a biographical caption. Speakers were chosen and asked to address different time periods of Jay’s life as well as his wide-ranging interests. Some chose to speak from notes; others not; everything flowed without any missteps. It made me reflect on my experience some years ago assisting in writing the eulogy for a wine industry figure whose service took place at Grace Cathedral in San Francisco. The Governor delivered the eulogy, and it required more than the average number of re-writes: I learned a lot about how a eulogy is an extremely unusual speech, needing to be descriptive and personal, yet not showy in terms of language or style. Back to Jay Corley’s memorial: There was a touch of the spiritual. There were baskets of tissues and understated white flowers wherever you turned. The program, in color, included numerous illustrations and photos, of Jay, of his favorite expressions as displayed on his desk and more. There was a room devoted to photos and favorite memorabilia, with a book to sign. There was food and of course, abundant wine, as well as touches such as a popcorn machine and an ice cream ‘stand.’ The family played it safe with a tent, putting it up the day before in the rain, only to have the day of the memorial be clear and even a touch sunny. One of the toughest things a publicist can do is to guide a family or a business through a memorial or a funeral. What can you do to get ready or be prepared? The basics of the event are easy: it’s the nuances of what the person was like which are key. That means….pay attention to those around you; soak up their stories and the texture of their lives…in case you need to re-create that life and paint a picture one day in a eulogy or an obituary. Opus One is looking to file the position of “Communications Manager” and by the look of the job description it’s a position that, if filled correctly, then executed upon with gusto and commitment, could easily produce a person who might readily be on the GM track. • In collaboration with the Vice President of Communications, develop and execute a global Social Media Communications plan. • Generate and manage all content (images, video, music and written copy). Working with designers, marketing and sales, external influencers and industry experts, produce relevant content that is consistent with the Opus One story and vision, and reflects our core values in social media spaces. • Collaborate with sales and marketing to ensure consistency of message, and visual harmony across all social media. • Monitor, listen and respond to users on all social platforms with passion, enthusiasm and decorum. • Establish effective benchmarks (best practices) for measuring the impact of our social media strategy. Report monthly on effectiveness of campaigns and provide insights for refinement. • Monitor and stay abreast of trends in global Social Media platforms, SEO, tools, applications, channels, design and strategy. • Serve as a digital educator and champion for the social community. • Understand complex CRM systems/data and effectively translate this knowledge into solutions that automate processes and increase our ability to dynamically personalize customer communications and on-site reception. • Champion the expanded use of CRM. Continually build and maintain the relationship with all partners and stakeholders in the CRM functional area to ensure CRM is at the forefront of everyone’s agenda and solidly defined/interwoven into their planning and daily work routines. • Identify opportunities and build relationships with prominent influencers and thought leaders in the luxury wine space (trade, distributors and collectors) and with other luxury product producers. • Work with guest relations and direct marketing to maintain a customer-focused attitude with a focus on activities that create lifetime customers. • Actively monitor daily newsfeeds for critical trends or breaking news regarding the wine industry or Opus One. Share, comment, or reply as appropriate either directly or through social media channels as appropriate. • Working with the Vice President of Communications, draft and release press announcements. • Effectively manage charitable donation requests based on established goals and criteria. • Develop, coordinate and execute major auction donations as needed. • Maintain, update, and expand knowledge of viticulture, enology and the Winery by participating in educational trainings offered by Opus One and outside sources. • Speak knowledgeably about Opus One vintages, representatives, distributors, and retailers to better assist customers in the social community. • Conduct tours of the winery as necessary and appropriate. The things that are really missing from this position that a future GM would need to master is finance and personnel management. You also might want someone versed in industry compliance and legal matters, but, frankly, that’s easy enough to learn. Finally, take note of the fact that this “communications” position does not include media outreach in its description. No doubt Opus One does in fact engage in serious media communications, perhaps even outsourcing it. However, it’s ironic that today, “communications” does not explicitly include media relations. Does this mean that social media outreach and media outreach are two entirely different things. You bet it does. The latter scares most people, while the former is often seen as an entirely different skill. The beauty of this type of “communications” position is that it puts you in touch with and forces collaboration with members of an organization’s team located in all departments. The reason for this is that industry and consumer expectations are such that each level of a company must in some way be accessible. Additionally, the expertise lodged within each department of a company like Opus One has to be understood and viewed as a public asset; as a potential and likely spokesperson that can help the company communicate with and reach out to various sectors of the industry and public. 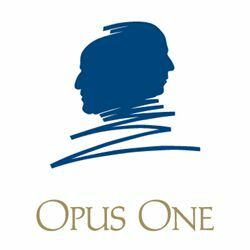 The Opus One Communications Manager job is an absolutely plum position for anyone thinking they want a long-term career in the wine industry. And the reach of Opus One into the three-tier channel, the DTC channel and into the web of the Napa Valley wine industry community gives the successful candidate remarkable exposures throughout the industry. If I were 5-10 years into a career in marketing in the industry and wanted more of the same, I’d throw everything I had at obtaining this position. Signup for advice to be delivered directly to your email address. Does wildlife = great wine? Copyright © 2019 SWIG. All Rights Reserved.